Left: section of a pancreatic cancer patient's primary tumor, with cancer cells (red/pink) and CK19, a marker of proliferation (green), evident. Right: Sample of a patient's liver reveals 17 isolated DCCs (disseminated cancer cells). These cells are dormant, but activate when T cell levels in the patient drop, as they do immediately following surgery. This provides a clue about how to avoid liver metastasis in pancreatic cancer patients who undergo surgery. The 2-week period following surgical removal of pancreatic tumors offers a window during which efforts might be made to keep cortisol levels down and T cells strong so the patient’s own immune system can kill cancer cells that have already made their way to other parts of the body. Cold Spring Harbor, NY — Scientists at Cold Spring Harbor Laboratory (CSHL) have solved a mystery about how pancreatic cancer spreads following surgery in patients whose tumor is successfully removed. After surgery, patients typically experience a two-week period during which their immune system is depleted as a result of a surge in post-operative stress hormone (cortisol) levels. With killer T-cell levels sagging, isolated, dormant cancer cells that have already traveled to the liver and possibly other organs via the bloodstream begin to grow or metastasize. Surgery is usually not an option for pancreas cancer patients, since most are diagnosed after the primary tumor has metastasized. This helps explain why only 8 percent of those diagnosed are still alive after 5 years. But doctors have been puzzled by the poor outcome in patients who should do better: the minority whose tumor seems confined to the pancreas at the time of diagnosis, and thus qualify for surgery. In many such patients, the liver, inspected during the operation, appears cancer-free. Yet within two years, most of these patients develop lethal metastatic cancer, often in the liver. Today in Science a team led by Fearon and Dr. Arnaud Pommier in his lab, explains that dormant cancer cells are already in the liver well before patients have their primary tumor removed. They are likely carried there by the bloodstream, having been shed by the primary tumor. Fearon estimates that in a typical patient, 14 million cancer cells pass through the liver every day. The immune system can kill most of the cancer cells deposited in the liver, but often it isn’t completely effective. Fearon and others have discovered in recent years how the immune system can be tricked or hijacked by cancer cells. The new discovery is one example. The immune system seeks out and destroys cancer cells by sensing proteins called MHC1 and CK19 that are present on the outer membrane of the cancer cells. 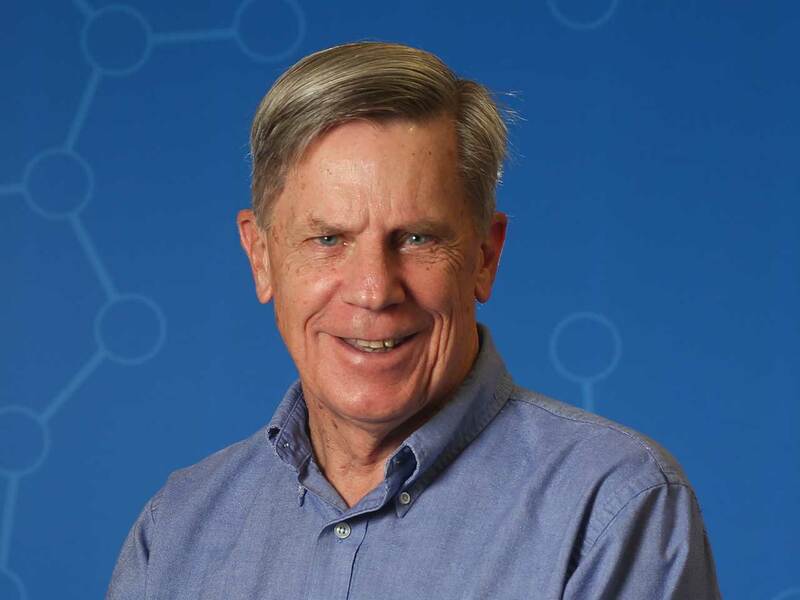 Fearon’s team found that the cancer cells that have been lying dormant in the liver of pancreatic cancer patients don’t express these proteins, so killer T cells can’t find them. 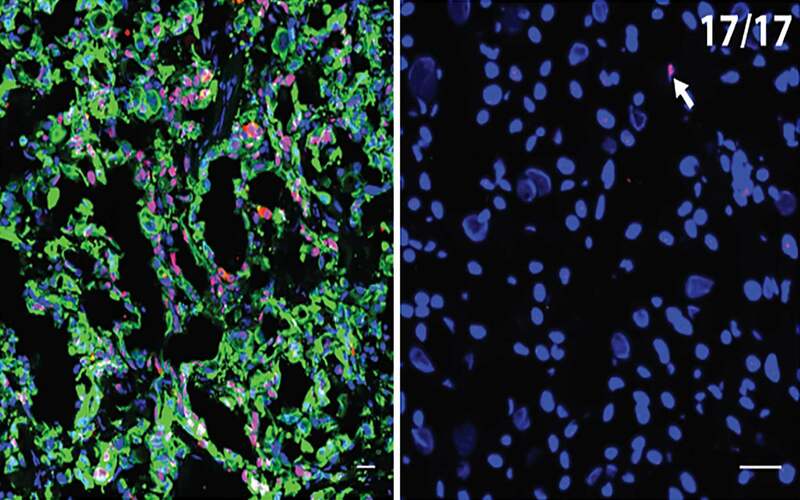 In situations such as post-operative surgical stress, where T cells in the liver are depleted, the dormant cancer cells start to express MHC1 and CK19 surface markers again and begin to divide, becoming seeds of metastatic lesions. Lustgarten Foundation; Cedar Hill Foundation; NIH-National Cancer Institute; Philippe Foundation. Pommier A et al, “Unresolved endoplasmic reticulum stress engenders immune-resistant, latent pancreatic cancer metastases” appears in Science May 17, 2018.